9036 Rare Brewster Manufacturing Co.
mother-of-pearl clock in great condition. If you collect clocks based on quality over quantity than this may be for you. It will be hard to find a better example. This company was only in business for two years from 1852 – 1854 so the number of their clocks still out there must be fairly small. The case has a black background with mother-of-pearl, colorful flowers and stencil designs. 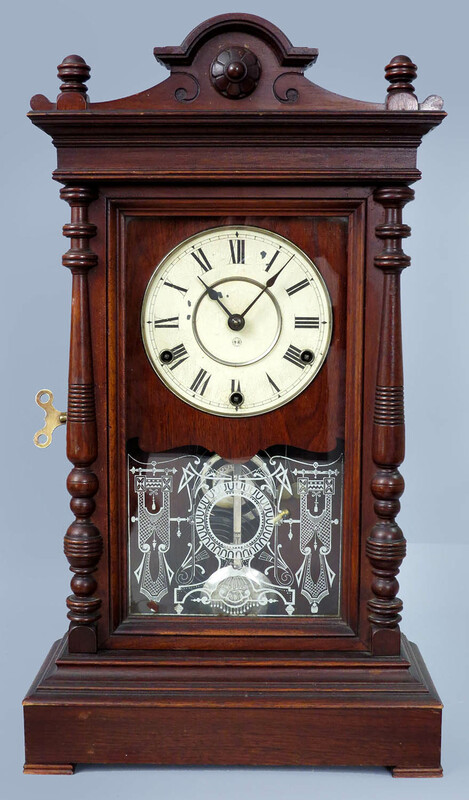 This clock has been well cared for and seldom handled because all that decoration is virtually perfect without any wear in the normal spots. I do not see any missing pieces of that mother-of-pearl. There are two flaws that need to be mentioned however. On the portion of the sides just above the scroll feet, the case edges should be curved like the rest but you can see that they are slightly flattened due to a couple of thin chips. That loss does not extend into any of the decoration. Both glasses are original including the tablet which is cut glass, not frosted. The zinc dial has a raised chapter ring and colorful corners with very minimal paint loss. The label is in great condition without any lifting or tears. 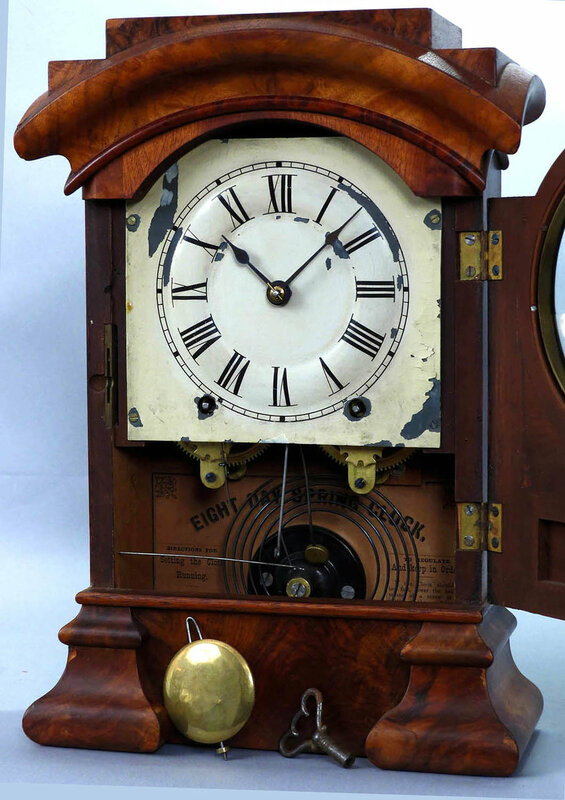 This clock comes with the original pendulum, key and early style hands. 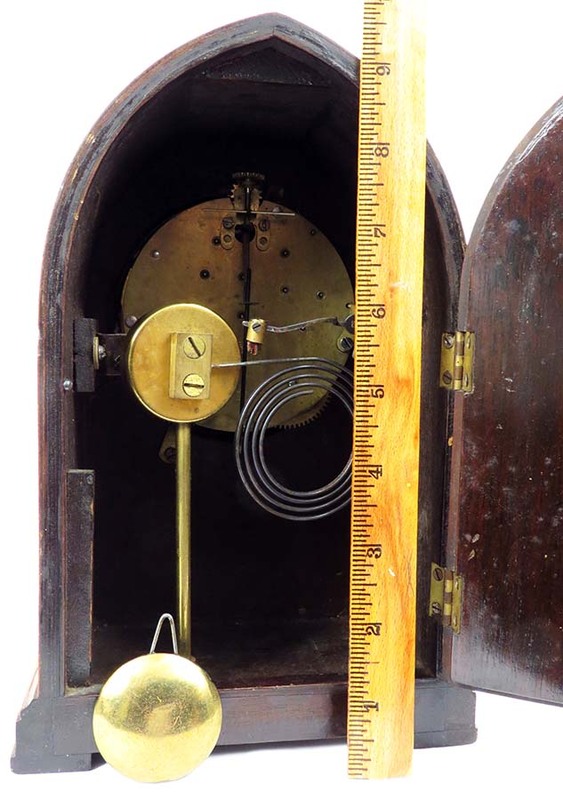 This is an eight-day clock with hourly strike on a coil gong and it is running. 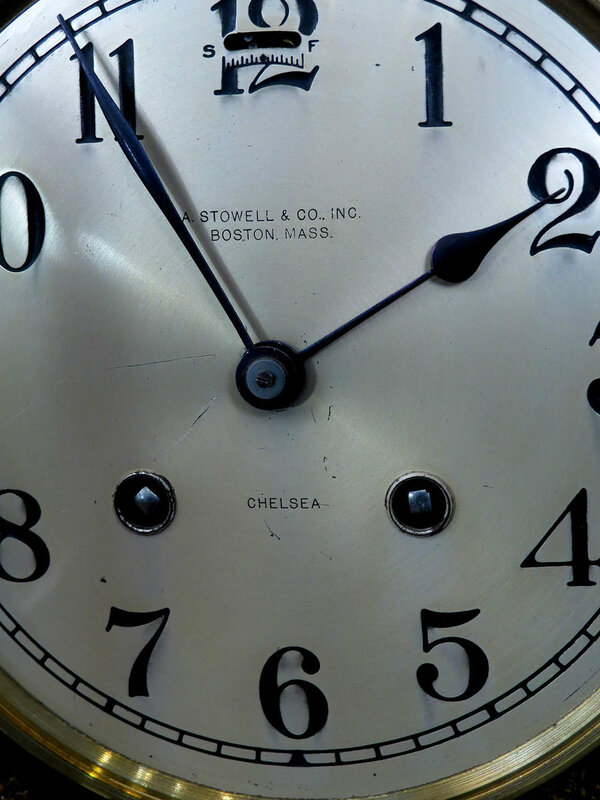 The movement is signed “Brewster & Ingrahams, Ct. U.S.” so that dates the clock fairly accurately to 1852 when that company became Brewster Manufacturing. 9037 Rare Seth Thomas Atlas quarter chiming mantle clock. The solid walnut case has an untouched original finish and it is in great condition but for a missing block at the lower left rear corner. There are three-quarter turned columns on the door and quarter columns at the back edge. This is the sister to the Hecla model. The Marcy wall model also used this quarter chime movement. The original stenciling on the glass shows no wear at all. The painted dial is signed with the “ST” logo and has a few small paint flakes. There is a good label on the interior and an 1885 stamp date on the back. It comes with the original hands, key and damascene nickel plated pendulum. 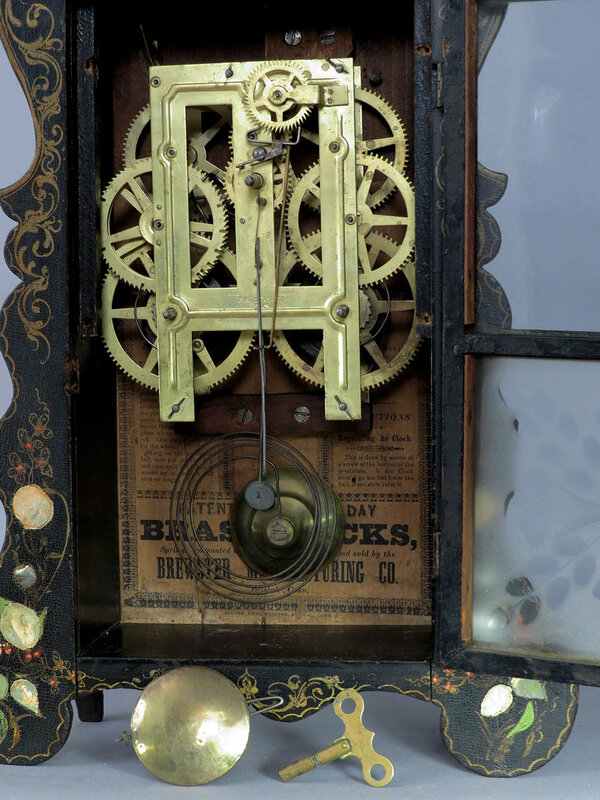 This clock has that massive quarter chiming movement that strikes two different notes on bells at the quarter hour, four notes on the half-hour, six notes on the three-quarter hour then eight notes on the hour plus it strikes the hours on a large cathedral gong. I do not know when it was last serviced but it is currently running and chiming properly. 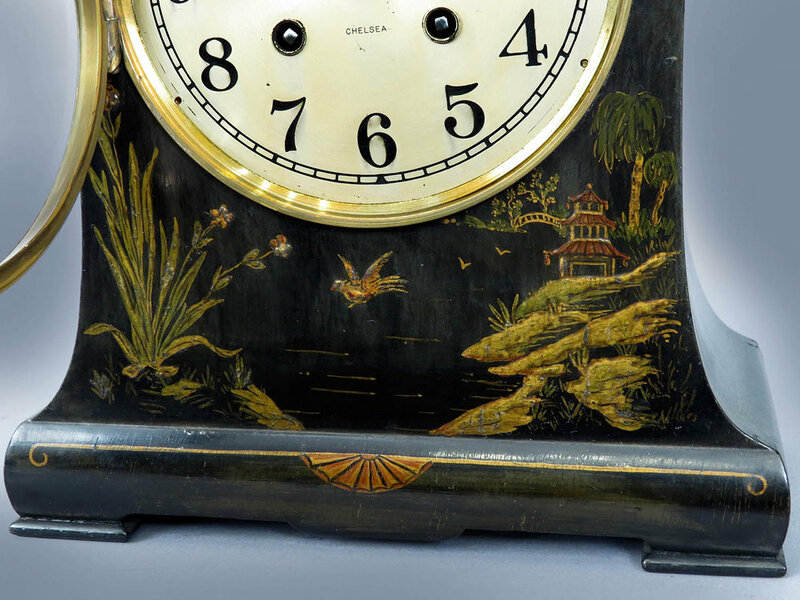 9038 Chelsea Chinese Chippendale mantel clock. This is a fine clock in superior condition. The case has a black lacquer finish with Oriental scenes in raised relief and a pagoda top with a tiled design roof. The overall case condition is excellent, without any faults. The silvered dial is also in very good condition and signed “Chelsea” plus “A. Stowell & Co. Inc., Boston, Mass.” That would have been the retailer. It has a heavy cast brass bezel with a thick flat beveled glass. The hands and key are the originals. This clock has that famous high quality Chelsea eight-day lever movement with hour and half-hour strike on a very resonant cathedral gong. It strikes the standard hours, not ship’s bell time. That movement is serial numbered 103822 which dates to about 1916. The case is stamped 104407. I do not know why they are different but there is every indication that this is the original movement and dial for this case. The clock is in good running order. 9039 Seth Thomas Arch Top mantle clock. This model is usually found with major veneer damage because of the number of complicated molding curves on the case. While this one does have several small veneer chips, the condition is much better than average. The fancy figured walnut case is very clean and nicely refinished. It has the original painted zinc dial which does have some paint losses. It has a great label in near mint condition plus the original hands, pendulum and key. This is an eight-day clock with hourly strike on a coil gong and it is running. 15 ½ inches tall. $185. 9040 Seth Thomas Atlanta mantel clock. 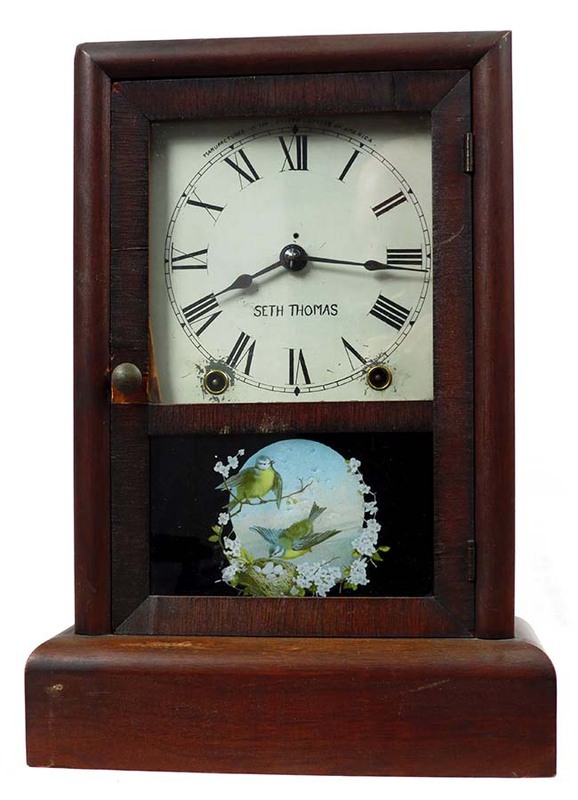 One of the famous Seth Thomas City Series clocks, this one has a mahogany case which was refinished many years ago and a bit of cleaning would make the grain of the veneer much more visible. The goldleaf decoration around the door has largely worn away from years of cleaning the glass. That glass has the original stencil decoration. The painted zinc dial is original and has the Seth Thomas logo. There is a reasonably good label in the bottom of the case and the back has a date stamp of 1881. The clock comes with the original hands, key and nickel plated pendulum with damascene decoration. 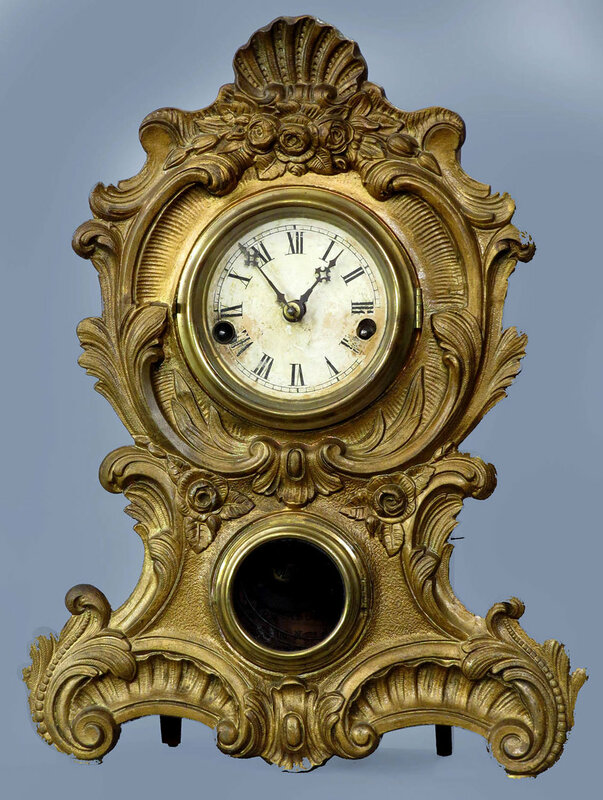 This is an eight-day clock with that large, good-quality Seth Thomas lyre movement with Geneva stops. It strikes the hours on a cathedral gong. It is running but it is due for a cleaning and I do see at least one bushing that will need attention in the near future. 19 ½ inches tall. $165. There are no damages to this cast metal case but the front was repainted gold many years ago. The original dial paper does show some wear and discoloration. The hands and pendulum are replacements and it has a reasonably good label. This is a 30 hour clock with hourly strike on a coil gong. It is running but that strike train will need adjustment because the fly seems to be hanging up. 14 ½ inches tall. $75. 9042 Welch, Spring & Co., Forestville, Ct. 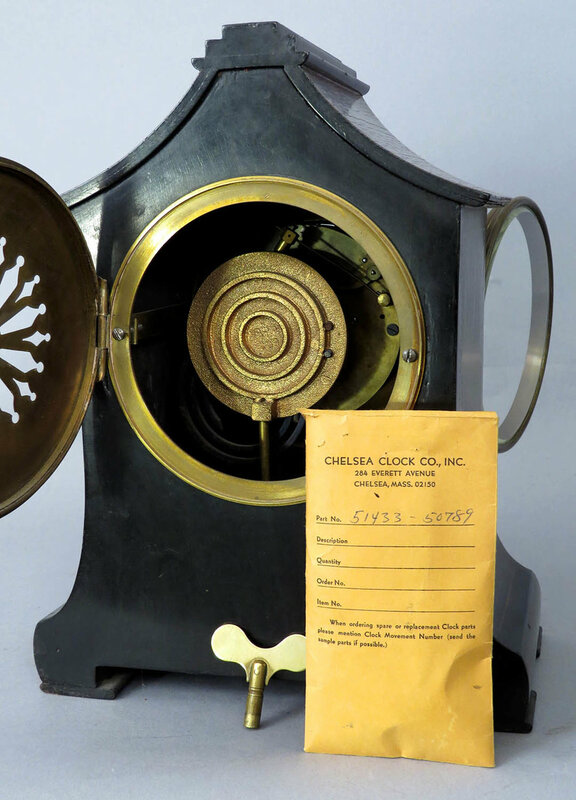 Simply called the “Small Column” shelf clock in their 1869 catalog, this wonderful little clock would have been deserving of a much better name. The rosewood case has been beautifully refinished and it does not have one flaw or damage. Half-columns flank the door which has two perfect, original reverse stenciled glasses. It has a repainted zinc dial with raised chapter ring and an excellent label. It also has the original hands and pendulum. This is a 30-hour timepiece plus alarm, meaning it does not strike the hours. It has been running well for me for several months. 9043 Seth Thomas mantle clock. I could not find this exact model in the Seth Thomas catalogs but I think it is a variation of the Chicago from the City Series. The mahogany case has been refinished and it could use a coat of wax or furniture polish because the case is rather dull. Otherwise, the case is in excellent shape without any veneer chips or damages. The original painted dial is signed and patent dated 1878. You can see that it has one area of paint flaking. The clock retains the original hands, key, glass and brass damascene pendulum with the Seth Thomas logo in the center. This is an eight-day clock with hourly strike on a nickel plated bell. It has that large lyre movement with Geneva stops. It is running but it has not been serviced recently and I can see one bushing that will need attention sometime in the near future. 17 ½ inches tall. $125. 3047 Seth Thomas "prospect No. 0" mantle Clock. 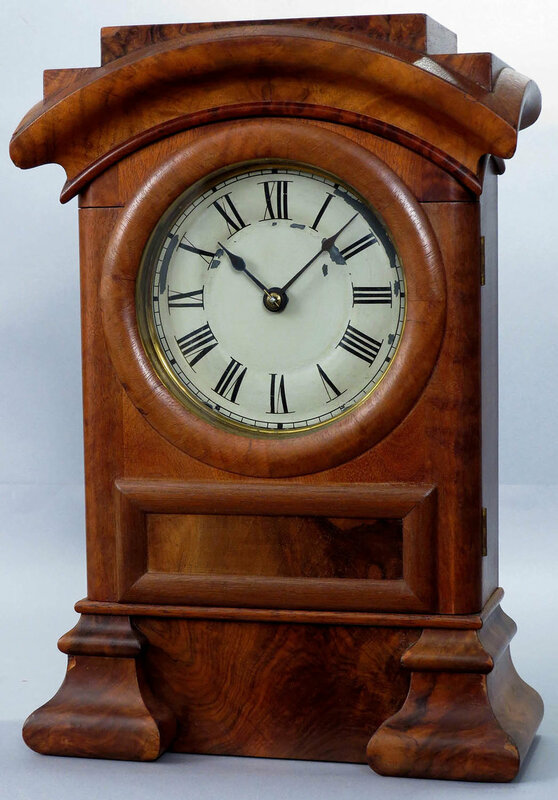 The mahogany case on this clock has been refinished and is in very clean condition. There are no case problems or chips at all. The feet are turned brass and it has a pressed brass bezel with a convex glass. The signed dial is painted to resemble porcelain and is in quite good condition. The hands and pendulum are the originals. This is an eight day clock with hour and half hour strike on a gong. It does tick and strikes properly but runs only a short while and it is apparent that it is due for a cleaning. 4025 Seth Thomas "Essex" mantle clock. This clock is almost identical to the one above. The mahogany case is also very clean and without any damages. The porcelain dial is also perfect and it also has a heavy cast brass bezel. The convex glass is a replacement while the hands and pendulum are the originals. This clock is an eight day model with hour and half hour strike on a cathedral gong. It runs for me for a short while before stopping so it is due for a cleaning. 2323 Seth Thomas cottage clock. The rosewood case has the original finish which is very clean and in almost perfect condition. The decoration on the glass has largely worn away. The dial has been recently repainted and it has a label which is stained but still legible. It retains the original pendulum and "ST" hands. This model has the dependable, large, signed eight day lyre movement with Geneva stops. I do not see anything amiss with the movement except for the fact that it has not been cleaned in many years. There is an hourly strike on a coiled gong. 4085 Seth Thomas mantle clock. This clock has a rosewood case with a darkened original finish and a simple case cleaning would make it look much better. There is one veneer chip at the door knob and another on the upper left corner of the door. It has a good signed dial with the original paint and an excellent label. The hands, pendulum, key and reverse decorated glass are the originals. This is an 8 day clock with hourly strike on a coil gong and it has that good quality movement with Geneva stops. It is running but is due for a cleaning.